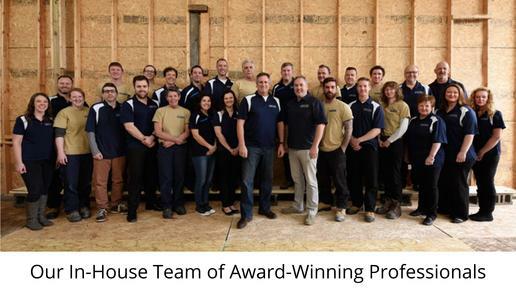 When the nominees for Renovator of the Year were being introduced at this year’s OHBA Awards Ceremony at Blue Mountain in Collingwood, Amsted Design Build founder Steve Barkhouse pondered the phrase “leadership in the industry” contained in the award qualifications and criteria in the introduction. To celebrate its 25th anniversary, Amsted set a unique goal for itself: to take part in 25 community acts that give back to the neighbourhoods where the company works. Amsted far exceeded its goals, participating in a number of charitable programs and events benefitting, among other organizations, the Boys and Girls Club of Ottawa, local food banks, the Ottawa Hospital and Ronald McDonald House. In addition, company staff put up bat houses in Kanata (to remedy a severe mosquito infestation) and both planted flowers and built an accessible gazebo at a local seniors’ home to allow residents to easily access the outdoors. “We went all out to give back,” Barkhouse exclaims. This year’s OHBA Renovator of the Year award is Amsted’s second consecutive win in the category. The award recognizes innovation and excellence in residential construction across Ontario, as well as outstanding professionalism and integrity within a company’s business, industry and the community it serves. Amsted has also been honoured with the Greater Ottawa Home Builders’ Association Housing Design award for Renovator of the Year six times, including back-to-back wins in 2014 and 2015. There’s also a GuildQuality feather in Amsted’s cap. The North American builder and renovator organization, which conducts third-party customer satisfaction surveys to help its members “deliver exceptional customer experiences and get the recognition they deserve for their commitment to quality,” bestowed Amsted with its sixth consecutive Guildmaster Award this year—one of only 17 design-build companies in North America to accomplish the feat. Established in 1989 as a one-man operation, Amsted Design-Build has evolved into a highly skilled team with more than 450 combined years’ experience in the construction industry. A number of the company’s staff has been with Amsted for over 15 years. This culture of loyalty and stability has allowed the growing firm to invest in ongoing training in order to stay on top of the latest building techniques and technologies, including LEED-certified design, heritage preservation and green building.